When I was a kid, my mother made a cabbage dish that had no name. It was basically cabbage with tomatoes, and it was typically served with cooked potatoes mixed in. Sometimes the dish had tiny shreds of pork, but often it was just the cabbage and potatoes. Because it was nameless, I called it "good cabbage." I could eat vats of it. Seriously. Big, giant bowls of cabbage. I think I've mentioned before that I was a weird kid, right? If you needed more proof, there it is. The history of that particular recipe was never revealed. I don't know if it's something my mother threw together out of desperation - I mean, it's pretty cheap and filling - or whether she got it from someone else. But then I was introduced to a Polish dish called Bigos, or Hunter's Stew. It's a pork-and-cabbage dish with tomato, but the proportions are completely different that mom's pork and cabbage and tomato dish. 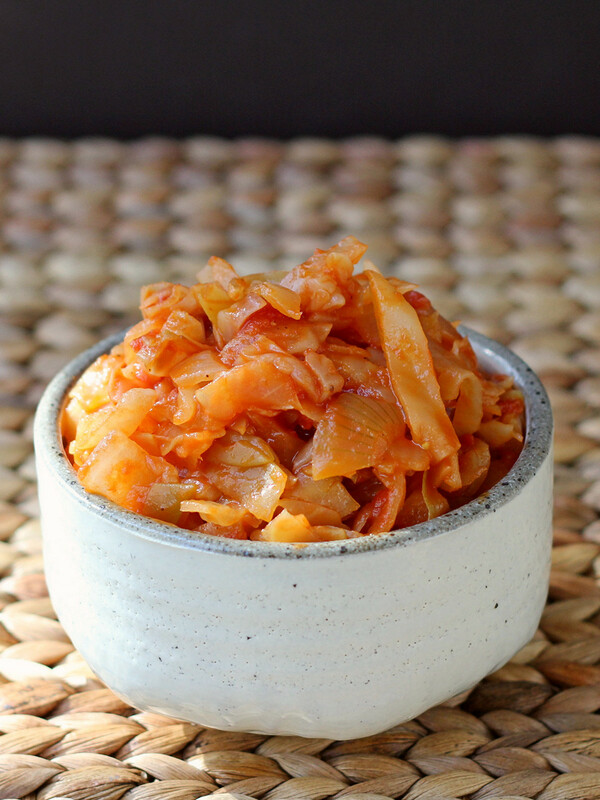 Bigos, depending on who is making it, can have more pork than cabbage. And there's not as much tomato. But it's the same three primary ingredients. The only thing I can think of is that mom started off with a bigos recipe, but cut back on the pork over time until it was almost gone. Or entirely gone. Funny thing was that although I liked pork in other dishes, I really didn't care for the little shreds of pork in mom's ... whatever dish. So I eliminated it entirely when I started making it. Now, if it's hunter's stew, it's either the result of an unsuccessful hunt, or maybe the hunters were just armed with cameras. And, since this version used olive oil (sometimes I use butter) it's actually vegan. What's weirder than a vegan hunter's stew, huh? This is a rustic, homestyle, family dish. It doesn't require precise knife skills. You can hack the cabbage up with a machete if you want. I'm serious. It doesn't need to be even at all. It's great if it's bite-sized pieces, because this isn't something you'd want to cut up with a knife. But otherwise, it's all up to you. This also isn't a recipe where mise en place is required, either. The onion can be demolished while the oil gently heats, and the cabbage can be added as you chop. This recipe really was born in poor farmhouses, and I see no reason to fancy it up. You might notice that there aren't any herbs or spices here besides the simple salt and pepper. To be honest, I can't think of one that I would add to this. Maybe chives, but this already has onions for that flavor. Heat the olive oil gently in a large, heavy-bottomed pot or a Dutch oven. Chop the onion into bite-size pieces. I usually cut in in half through the root end, then cut the halves into four pieces, then slice those. A large dice would be fine, if you prefer. Put the onions into the pot and stir. Let them cook slowly while you start chopping the cabbage. You're looking for them to sweat rather than brown. Chop the cabbage into fork-sized, bite-sized pieces. Add the cabbage to the pot a hand full at a time, stirring as you add the cabbage. When all the cabbage is in the pot, add the tomatoes, vinegar, salt, and pepper. Stir. Continue cooking at simmer, stirring as needed, until the cabbage is cooked through and has taken on a red color from the tomatoes. You'll see the difference, You'll start off with white and pale green cabbage in a tomato sauce, and then you'll have red-colored cabbage that has absorbed the tomato flavor. Taste for flavoring and add more salt, pepper, or vinegar, as needed. Figure that it will take about an hour for the cabbage to cook through, maybe a little longer. When it's done, the liquid should be mostly gone, but the cabbage should be moist. Serve warm. I like it served with boiled potatoes to mix in at the table.